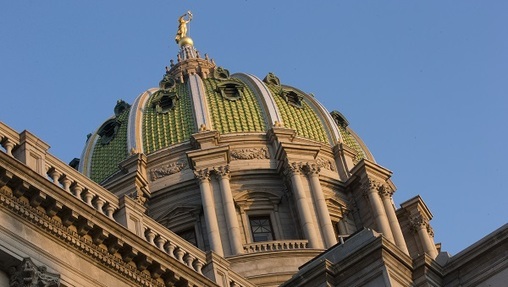 HARRISBURG (WSKG) — The state House and Senate are back in session after taking time off following the collapse of budget negotiations earlier this month. There’s no concrete strategy moving forward. But some lawmakers say they hope opposition to Governor Tom Wolf’s unilateral budget-balancing plan will eventually spur the body into action. Wolf has announced he intends to bring the state’s books in line by borrowing against liquor control board revenues, leasing out the state Farm Show complex, and not passing funding for state related universities. So now, the big question in Harrisburg is whether lawmakers will accept that, or come up with an alternative plan. House GOP Leader Dave Reed, of Indiana County, seemed skeptical any movement would happen soon. “You know, there seems to be some interest in closing it out among some folks. Maybe not so much among other folks,” he said. But Reed added, he does think it’s in the legislature’s best interest to come up with their own solution. Senate Appropriations Chair Pat Browne said the same. The Lehigh County Republican also noted that his caucus’s lawyers think Wolf’s plan has legality issues, though they don’t have a formal opinion yet. “A large financial move against a state asset only having one party to the transaction, and the ability to unilaterally do it, is going to raise serious legal concerns,” he said. Browne also said his chamber is firmly against withholding funding from Penn State, the University of Pittsburgh, and Temple and Lincoln Universities. In order to pass that funding, he said more money has to be found somewhere. “Our whole objective is for financial sustainability. And when you’re looking at holes in ’17-18, and holes in ’18-19 from the Governor’s perspective, then we have serious issues that we have to address,” he said. The administration has said its legal team vetted the plan, and that it’s all allowed. But Wolf has also made it clear that he’s willing to consider an alternative solution if the legislature comes up with one.